and, if the threshold potential is reached, an action potential occurs, an impulse travels along the muscle cell membrane, and the muscle contracts. Some muscles (skeletal muscles) will not contract unless stimulated by neurons; other muscles (smooth & cardiac) will contract without nervous stimulation but their contraction can be influenced by the nervous system. Thus, the nervous and muscle systems are closely interconnected. Let's now focus on muscle - what is its structure & how does it work. Highly magnified view of a neuromuscular junction (Hirsch 2007). Skeletal muscles are usually attached to bone by tendons composed of connective tissue. This connective tissue also ensheaths the entire muscle & is called epimysium. Skeletal muscles consist of numerous subunits or bundles called fasicles (or fascicles). Fascicles are also surrounded by connective tissue (called the perimysium) and each fascicle is composed of numerous muscle fibers (or muscle cells). Muscle cells, ensheathed by endomysium, consist of many fibrils (or myofibrils), and these myofibrils are made up of long protein molecules called myofilaments. There are two types of myofilaments in myofibrils: thick myofilaments and thin myofilaments. Skeletal muscles vary considerably in size, shape, and arrangement of fibers. They range from extremely tiny strands such as the stapedium muscle of the middle ear to large masses such as the muscles of the thigh. Skeletal muscles may be made up of hundreds, or even thousands, of muscle fibers bundled together and wrapped in a connective tissue covering. Each muscle is surrounded by a connective tissue sheath called the epimysium. 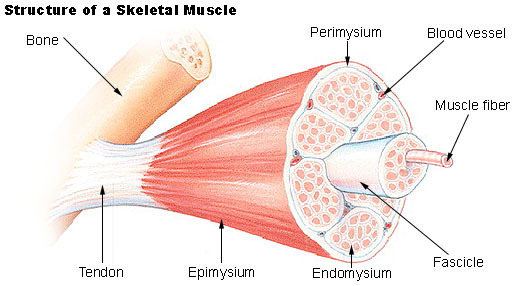 Fascia, connective tissue outside the epimysium, surrounds and separates the muscles. 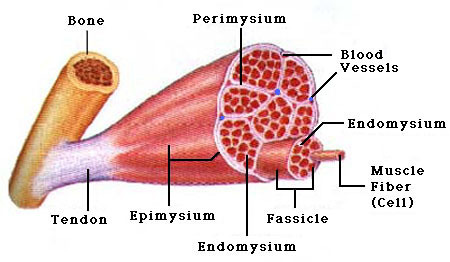 Portions of the epimysium project inward to divide the muscle into compartments. Each compartment contains a bundle of muscle fibers. Each bundle of muscle fiber is called a fasciculus and is surrounded by a layer of connective tissue called the perimysium. Within the fasciculus, each individual muscle cell, called a muscle fiber, is surrounded by connective tissue called the endomysium. Skeletal muscles have an abundant supply of blood vessels and nerves. Before a skeletal muscle fiber can contract, it has to receive an impulse from a neuron. Generally, an artery and at least one vein accompany each nerve that penetrates the epimysium of a skeletal muscle. Branches of the nerve and blood vessels follow the connective tissue components of the muscle of a nerve cell and with one or more minute blood vessels called capillaries (Source: training.seer.cancer.gov). The cell membrane of a muscle cell is called the sarcolemma, and this membrane, like that of neurons, maintains a membrane potential. So, impulses travel along muscle cell membranes just as they do along nerve cell membranes. However, the 'function' of impulses in muscle cells is to bring about contraction. To understand how a muscle contracts, you need to know a bit about the structure of muscle cells. Skeletal muscle is the muscle attached to the skeleton. Hundreds or thousands of muscle fibers (cells) bundle together to make up an individual skeletal muscle. 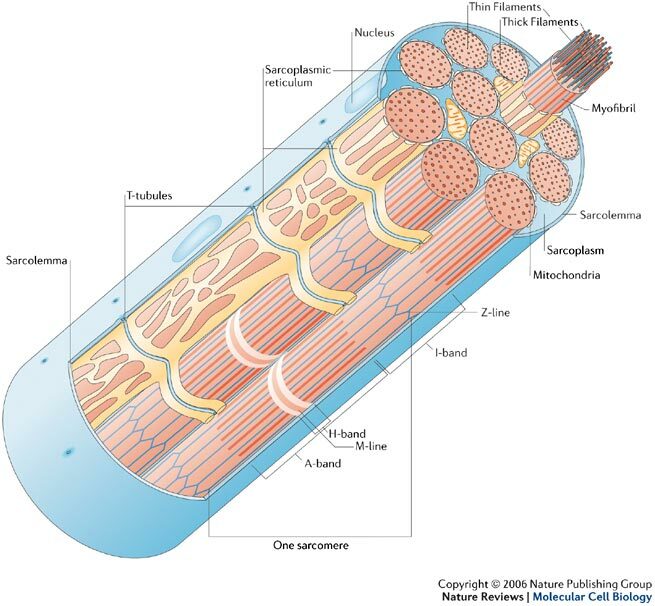 Muscle cells are long, cylindrical structures that are bound by a plasma membrane (the sarcolemma) and an overlying basal lamina and when grouped into bundles (fascicles) they make up muscle. The sarcolemma forms a physical barrier against the external environment and also mediates signals between the exterior and the muscle cell. The sarcoplasm is the specialized cytoplasm of a muscle cell that contains the usual subcellular elements along with the Golgi apparatus, abundant myofibrils, a modified endoplasmic reticulum known as the sarcoplasmic reticulum (SR), myoglobin and mitochondria. Transverse (T)-tubules invaginate the sarcolemma, allowing impulses to penetrate the cell and activate the SR. As shown in the figure, the SR forms a network around the myofibrils, storing and providing the Ca2+ that is required for muscle contraction. Myofibrils are contractile units that consist of an ordered arrangement of longitudinal myofilaments. Myofilaments can be either thick filaments (comprised of myosin) or thin filaments (comprised primarily of actin). The characteristic 'striations' of skeletal and cardiac muscle are readily observable by light microscopy as alternating light and dark bands on longitudinal sections. The light band, (known as the I-band) is made up of thin filaments, whereas the dark band (known as the A-band) is made up of thick filaments. The Z-line (also known as the Z-disk or Z-band) defines the lateral boundary of each sarcomeric unit. 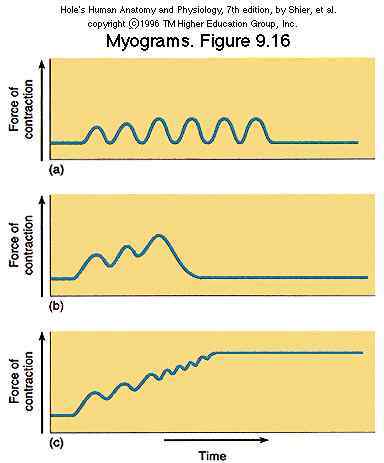 Contraction of the sarcomere occurs when the Z-lines move closer together, making the myofibrils contract, and therefore the whole muscle cell and then the entire muscle contracts (Source: Davies and Nowak 2006). The SARCOLEMMA has a unique feature: it has holes in it. These "holes" lead into tubes called TRANSVERSE TUBULES (or T-TUBULES for short). These tubules pass down into the muscle cell and go around the MYOFIBRILS. However, these tubules DO NOT open into the interior of the muscle cell; they pass completely through and open somewhere else on the sarcolemma (i.e., these tubules are not used to get things into and out of the muscle cell). The function of T-TUBULES is to conduct impulses from the surface of the cell (SARCOLEMMA) down into the cell and, specifically, to another structure in the cell called the SARCOPLASMIC RETICULUM. 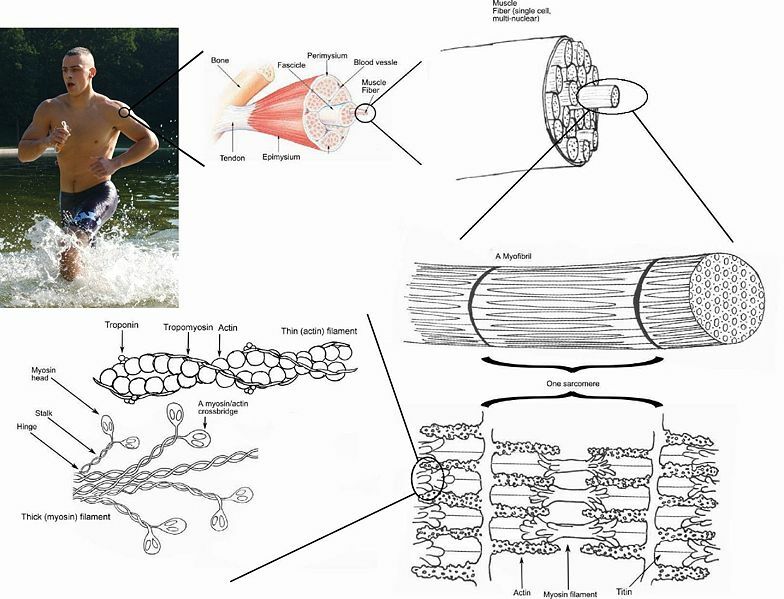 A muscle fiber is excited via a motor nerve that generates an action potential that spreads along the surface membrane (sarcolemma) and the transverse tubular system into the deeper parts of the muscle fiber. A receptor protein (DHP) senses the membrane depolarization, alters its conformation, and activates the ryanodine receptor (RyR) that releases Ca2+ from the SR. Ca2+ then bind to troponin and activates the contraction process (Jurkat-Rott and Lehmann-Horn 2005). Sarcoplasmic reticulum (SR) membranes in close proximity to a T-tubule. 'RyR' are proteins the aid in the release of calcium from the SR, 'SERCA2' are proteins that aid in the transport of calcium into the SR (Brette and Orchard 2007). The SARCOPLASMIC RETICULUM (SR) is a bit like the endoplasmic reticulum of other cells, e.g., it's hollow. But the primary function of the SARCOPLASMIC RETICULUM is to STORE CALCIUM IONS. 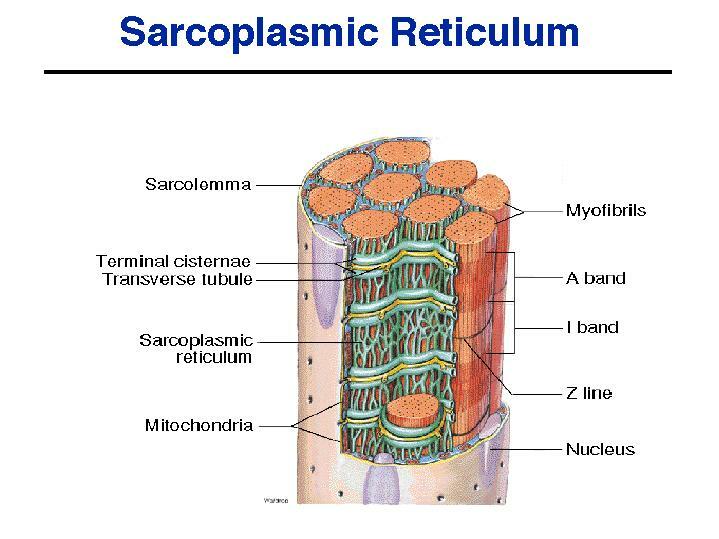 Sarcoplasmic reticulum is very abundant in skeletal muscle cells and is closely associated with the MYOFIBRILS (and, therefore, the MYOFILAMENTS). The membrane of the SR is well-equipped to handle calcium: there are "pumps" (active transport) for calcium so that calcium is constantly being "pumped" into the SR from the cytoplasm of the muscle cell (called the SARCOPLASM). As a result, in a relaxed muscle, there is a very high concentration of calcium in the SR and a very low concentration in the sarcoplasm (and, therefore, among the myofibrils & myofilaments). In addition, the membrane has special openings, or "gates", for calcium. In a relaxed muscle, these gates are closed and calcium cannot pass through the membrane. So, the calcium remains in the SR. However, if an impulse travels along the membrane of the SR, the calcium "gates" open &, therefore, calcium diffuses rapidly out of the SR & into the sarcoplasm where the myofibrils & myofilaments are located. This, as you will see, is a key step in muscle contraction. 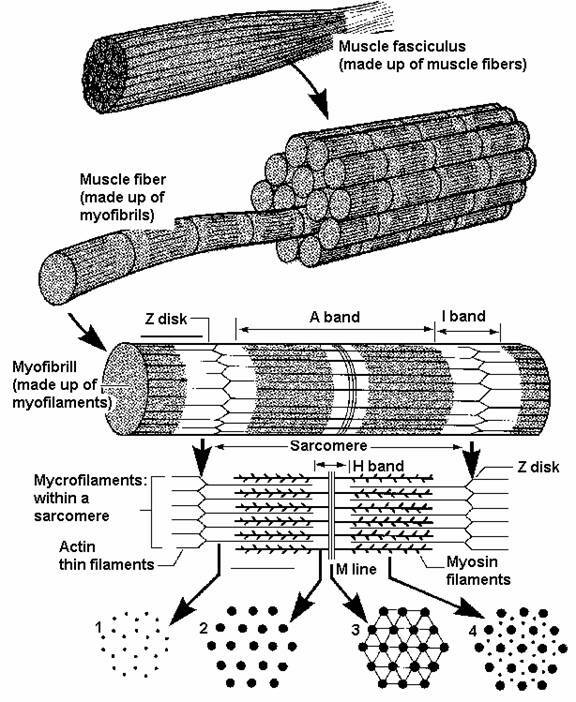 Myofibrils are composed of 2 types of myofilaments: thick and thin. In skeletal muscle, these myofilaments are arranged in a very regular, precise pattern: thick myofilaments are typically surrounded by 6 thin myofilaments (end view). In a side view, thin myofilaments can be seen above and below each thick myofilament. Myofibril cross-section showing arrangement of thick and thin myofilaments. Source: Tskhovrebova and Trinick (2003). Each myofibril is composed of many subunits lined up end-to-end. These subunits are, of course, composed of myofilaments and are called SARCOMERES. The drawings above & below show just a very small section of the entire length of a myofibril and so you can only see one complete SARCOMERE. In each sarcomere, thin myofilaments extend in from each end. Thick myofilaments are found in the middle of the sarcomere and do not extend to the ends. Because of this arrangement, when skeletal muscle is viewed with a microscope, the ends of a sarcomere (where only thin myofilaments are found) appear lighter than the central section (which is dark because of the presence of the thick myofilaments). Thus, a myofibril has alternating light and dark areas because each consists of many sarcomeres lined up end-to-end. This is why skeletal muscle is called STRIATED MUSCLE (i.e., the alternating light and dark areas look like stripes or striations). The light areas are called the I-BANDS and the darker areas the A-BANDS. Near the center of each I-BAND is a thin dark line called the Z-LINE (or Z-membrane in the drawing below). The Z-LINE is where adjacent sarcomeres come together and the thin myofilaments of adjacent sarcomeres overlap slightly. Thus, a sarcomere can be defined as the area between Z-lines. Thick myofilaments are composed of a protein called MYOSIN. Each MYOSIN molecule has a tail which forms the core of the thick myofilament plus a head that projects out from the core of the filament. These MYOSIN heads are also commonly referred to as CROSS-BRIDGES. it has ATP-binding sites into which fit molecules of ATP. ATP represents potential energy. it has ACTIN-binding sites into which fit molecules of ACTIN. Actin is part of the thin myofilament and will be discussed in more detail shortly. it has a "hinge"at the point where it leaves the core of the thick myofilament. This allows the head to swivel back and forth, and the "swivelling" is, as will be described shortly, what actually causes muscle contraction. Thin myofilaments are composed of 3 types of protein: ACTIN, TROPONIN, and TROPOMYOSIN. ACTIN - when actin combines with MYOSIN HEAD the ATP associated with the head breaks down into ADP. This reaction released energy that causes the MYOSIN HEAD to SWIVEL. TROPOMYOSIN - In a relaxed muscle, the MYOSIN HEADS of the thick myofilament lie against TROPOMYOSIN molecules of the thin myofilament. 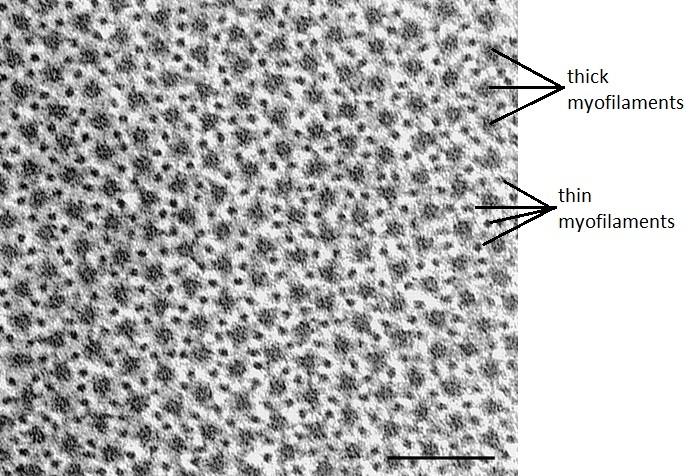 As long as the MYOSIN HEADS remain in contact with TROPOMYOSIN nothing happens (i.e., a muscle remains relaxed). TROPONIN - Troponin molecules have binding sites for calcium ions. When a calcium ion fills this site it causes a change in the shape and position of TROPONIN. And, when TROPONIN shifts, it pulls the TROPOMYOSIN to which it is attached. When TROPOMYOSIN is moved, the MYOSIN HEAD that was touching the tropomyosin now comes in contact with an underlying ACTIN molecule. 1 - Because skeletal muscle is voluntary muscle, contraction requires a nervous impulse. So, step 1 in contraction is when the impulse is transferred from a neuron to the SARCOLEMMA of a muscle cell. 2 - The impulse travels along the SARCOLEMMA and down the T-TUBULES. From the T-TUBULES, the impulse passes to the SARCOPLASMIC RETICULUM. 3 - As the impulse travels along the Sarcoplasmic Reticulum (SR), the calcium gates in the membrane of the SR open. As a result, CALCIUM diffuses out of the SR and among the myofilaments. 4 - Calcium fills the binding sites in the TROPONIN molecules. As noted previously, this alters the shape and position of the TROPONIN which in turn causes movement of the attached TROPOMYOSIN molecule. 5 - Movement of TROPOMYOSIN permits the MYOSIN HEAD to contact ACTIN (Animations: Myofilament Contraction & Breakdown of ATP and cross-bridge movement). 6 - Contact with ACTIN causes the MYOSIN HEAD to swivel. 7 - During the swivel, the MYOSIN HEAD is firmly attached to ACTIN. So, when the HEAD swivels it pulls the ACTIN (and, therefore, the entire thin myofilament) forward. (Obviously, one MYOSIN HEAD cannot pull the entire thin myofilament. Many MYOSIN HEADS are swivelling simultaneously, or nearly so, and their collective efforts are enough to pull the entire thin myofilament). 8 - At the end of the swivel, ATP fits into the binding site on the cross-bridge & this breaks the bond between the cross-bridge (myosin) and actin. The MYOSIN HEAD then swivels back. As it swivels back, the ATP breaks down to ADP & P and the cross-bridge again binds to an actin molecule. 9 - As a result, the HEAD is once again bound firmly to ACTIN. However, because the HEAD was not attached to actin when it swivelled back, the HEAD will bind to a different ACTIN molecule (i.e., one further back on the thin myofilament). Once the HEAD is attached to ACTIN, the cross-bridge again swivels, SO STEP 7 IS REPEATED. As long as calcium is present (attached to TROPONIN), steps 7 through 9 will continue. And, as they do, the thin myofilament is being "pulled" by the MYOSIN HEADS of the thick myofilament. Thus, the THICK & THIN myofilaments are actually sliding past each other. As this occurs, the distance between the Z-lines of the sarcomere decreases. As sarcomeres get shorter, the myofibril, of course, gets shorter. And, obviously, the muscle fibers (and entire muscle) get shorter. Skeletal muscle relaxes when the nervous impulse stops. No impulse means that the membrane of the SARCOPLASMIC RETICULUM is no longer permeable to calcium (i.e., no impulse means that the CALCIUM GATES close). So, calcium no longer diffuses out. 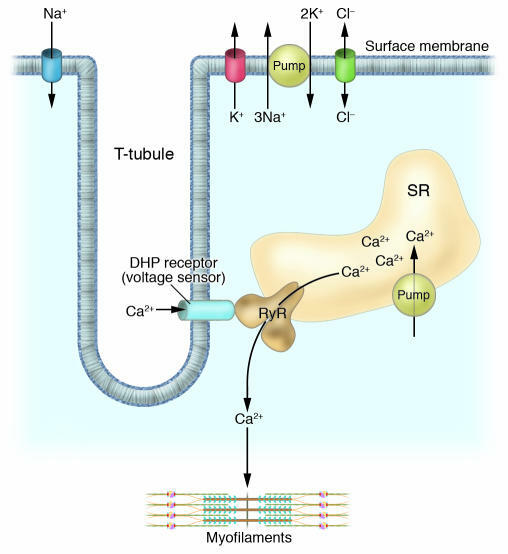 The CALCIUM PUMP in the membrane will now transport the calcium back into the SR. As this occurs, calcium ions leave the binding sites on the TOPONIN MOLECULES. Without calcium, TROPONIN returns to its original shape and position as does the attached TROPOMYOSIN. This means that TROPOMYOSIN is now back in position, in contact with the MYOSIN HEAD. So, the MYOSIN head is no longer in contact with ACTIN and, therefore, the muscle stops contracting (i.e., relaxes). So, under most circumstances, calcium is the "switch" that turns muscle "on and off" (contracting and relaxing). When a muscle is used for an extended period, ATP supplies can diminish. As ATP concentration in a muscle declines, the MYOSIN HEADS remain bound to actin and can no longer swivel. This decline in ATP levels in a muscle causes MUSCLE FATIGUE. Even though calcium is still present (and a nervous impulse is being transmitted to the muscle), contraction (or at least a strong contraction) is not possible. An important characteristic of skeletal muscle is its ability to contract to varying degrees. A muscle, like the biceps, contracts with varying degrees of force depending on the circumstance (this is also referred to as a graded response). Muscles do this by a process called summation, specifically by motor unit summation and wave summation. Motor Unit Summation - the degree of contraction of a skeletal muscle is influenced by the number of motor units being stimulated (with a motor unit being a motor neuron plus all of the muscle fibers it innervates; see diagram below). Skeletal muscles consist of numerous motor units and, therefore, stimulating more motor units creates a stronger contraction. If a muscle fiber is stimulated so rapidly that it does not relax at all between stimuli, a smooth, sustained contraction called tetanus occurs (illustrated by the straight line in c above & in the diagram below). cells do not contain sarcomeres (so are not striated) but are made up of thick & thin myofilaments. 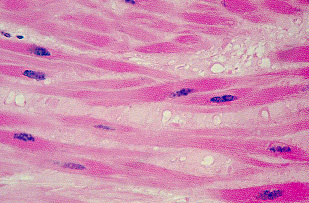 Thin filaments in smooth muscle do not contain troponin. calcium does not bind to troponin but, rather, to a protein called calmodulin. The calcium-calmodulin complex 'activates' myosin which then binds to actin & contraction (swivelling of cross-bridges) begins. Brette, F., and C. Orchard. 2007. Resurgence of cardiac T-tubule research. Physiology 22: 167-173. Davies, K. E., and K. J. Nowak. 2006. Molecular mechanisms of muscular dystrophies: old and new players. Nature Reviews Molecular Cell Biology 7: 762-773. Hirsch, N. P. 2007. Neuromuscular junction in health and disease. British Journal of Anaesthesia 99: 132-138. Hopkins, P. M. 2005. Foundations of anethesia, second ed. Mosby, London. Jurkat-Rott, K., and F. Lehmann-Horn. 2005. Muscle channelopathies and critical points in functional and genomic studies. Journal of Clinical Investigation 115: 2000-2009. Tskhovrebova, L., and J. Trinick. 2003. Titin: properties and family relationships. Nature Reviews Molecular Cell Biology 4: 679-689. Widrick, J. J., J. G. Romatowski, K. M. Norenberg, S. T. Knuth, J. L. W. Bain, D. A. Riley, S. W. Trappe, T. A. Trappe, D. L. Costill, and R. H. Fitts. 2001. Functional properties of slow and fast gastrocnemius muscle fibers after a 17-day spaceflight. Journal of Applied Physiology 90: 2203-2211.